In the days when movies were silent and the Twenties roared, Tom Mix was a movie star. Not just any movie star in the days when John Wayne, Roy Rogers, and Gene Autry were little boys, Thomas Edwin Mix was the most popular cowboy movie star in the world. 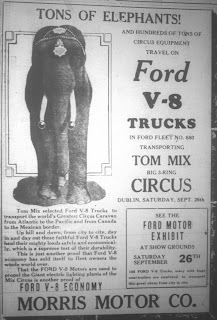 It was on a September Saturday some seventy-five years ago when Tom Mix came to Dublin and the people of Dublin saw their cowboy hero up close and in person. 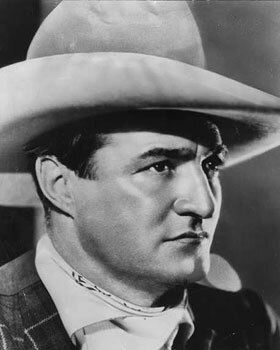 Tom Mix began his movie career in 1910 at the age of thirty. Over the next quarter of a century, Mix was reported to have appeared in more than 330 movies. All but a handful of those movies were talking pictures. At the height of his silent movie career, Mix was appearing in more than fifteen movies every year. 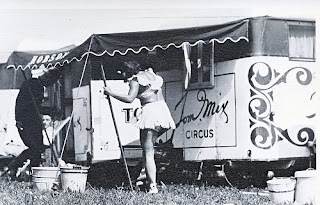 As his career in motion pictures began to wane, Mix launched a transcontinental tour in what was billed as the largest motorized circus in the world. 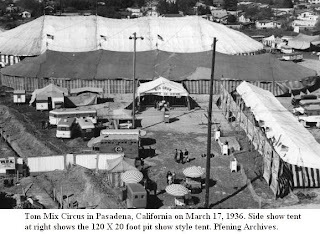 The four-million-dollar circus began its tour in Compton, California and featured the new and improved 150-foot round top. 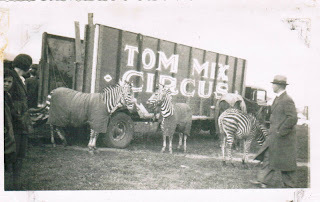 The equipment and animals were transported by night convoys of no less than sixty new semi trucks with beautifully painted red, white, and blue trailers. The walls, marquee, and curtains were striped in red and white. 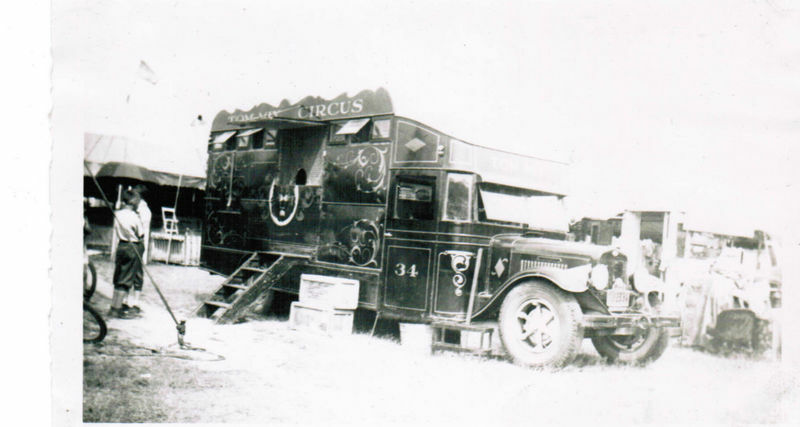 After performances in Athens and Macon, the three-ring circus arrived just before daylight in Dublin on the morning of September 26, 1936. The event was held on the old 12th District Fairgrounds at the corner of Telfair Street and Troup Street. 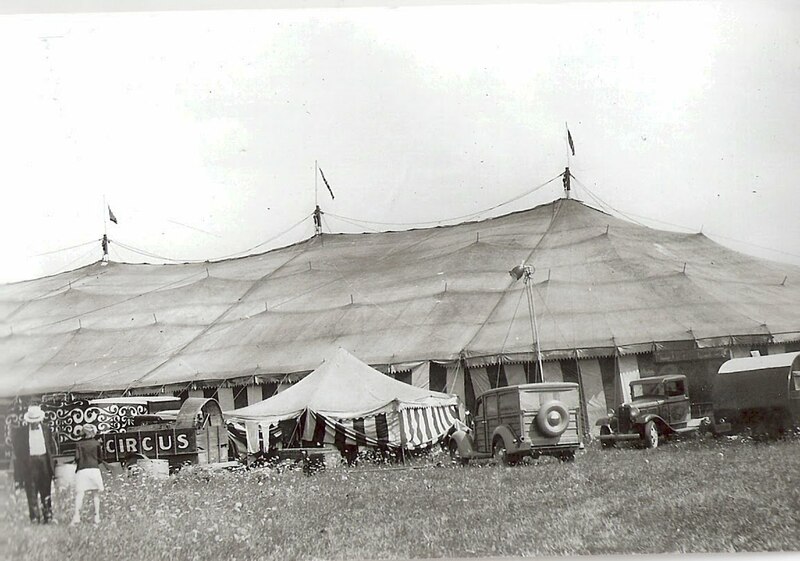 Crowds gathered around the fairgrounds in the early morning to witness the erection of the circus city, a show in of itself. A matinee performance took place at 2:00 followed the grand finale during the evening show at 8:00. 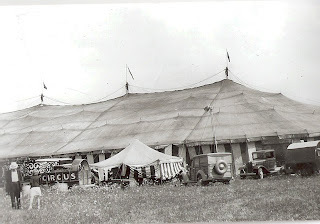 The Tom Mix Circus followed right on the heels of its main motorized circus competitor, the Downie Brothers - Sparks Circus, which came to the old fairgrounds the week before. The Downie Brothers hired Jack Hoxie, a silent movie cowboy movie veteran, to compete with the vastly more popular, Tom Mix. The Downie circus was much smaller, but drew good crowds wherever it went, even during the dark days of the Great Depression. 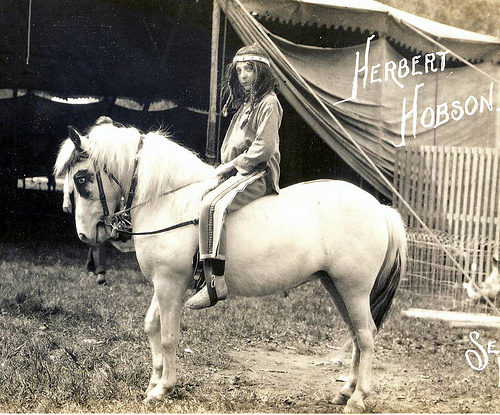 Nearly one hundred and fifty horses and ponies were used in the show. 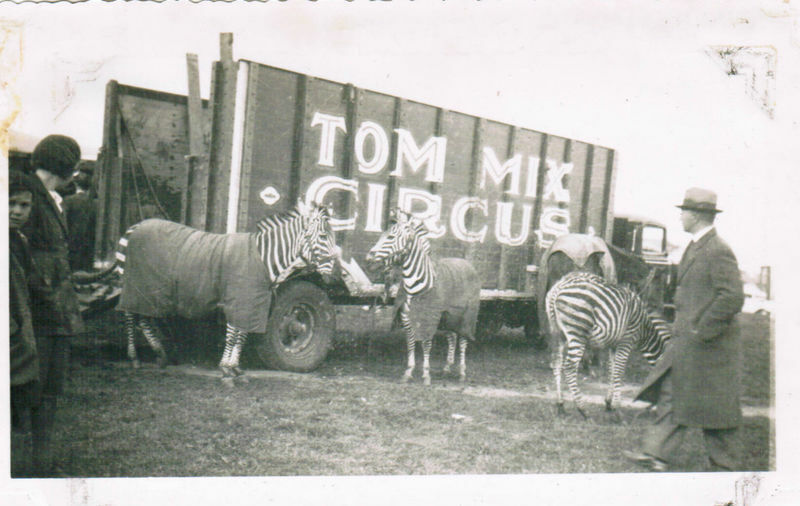 To make it a well-rounded circus, Mix gathered monkeys, baboons, lions, deer, and dogs along with three elephants and a zebra for his circus, which employed more than 500 performers, including sixty aerialists, sixty riders, and two hundred stars on the floor of the arena. In addition to Mix, the star of the show, the audience was thrilled by acrobatic performers, the Flying Arbaughs and Erma Ward, "The Queen of the Air." 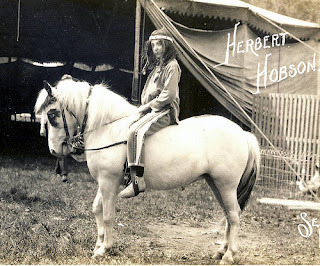 The fabulous Riding Hobsons and Max Gruber's Jungle Oddities rounded out the show. The Arbaughs teamed with Ward Codona Troup to form the largest flying acrobatic show ever performed. Mix personally led the Parade of the Royal Mounted consisting of more than eighty mounted riders. A Courier Herald writer reported, "Mix was very gracious about signing autographs for juvenile fans crowded about shyly extending autograph books." Always by his side was Mix's horse and a crowd favorite, Tony, Jr. - the first Tony having died years before. Homer Hobson, Helen Ford and Joe Bowers opened the show with an amusing performance of trained dogs and monkeys. 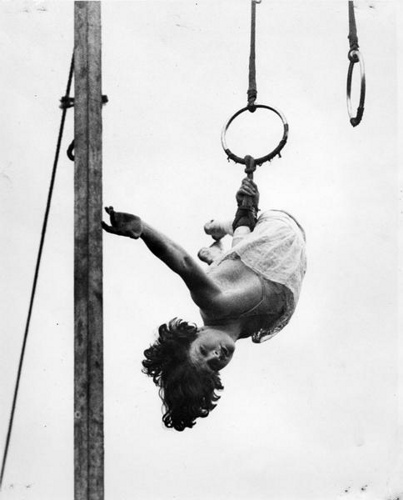 Along with a requisite corps of circus clowns, the show featured twenty girls performing on swinging ladders. Next came more female performers, Del Herberto, Mlle Lorenzo, and Ella Davenport and a company of Lady polo riders led by Helen Ford and Company. Charles Arley, who performed a head balancing act on a revolving trapeze, and Les Cotelettis Troupe of comedic acrobats had the crowed laughing out loud. 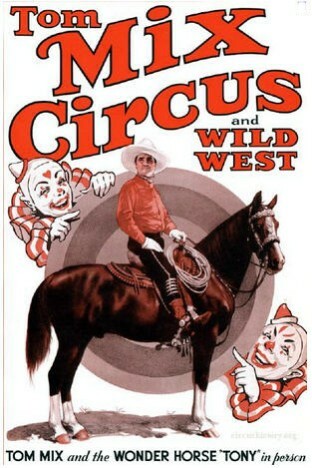 The main center ring event followed with Tom Mix's company of cowboys and horses. Mix demonstrated his riding and marksmanship skills by riding and firing at moving targets. He climaxed the performance by lying flat on his back and shooting light bulbs in a dome over his head. Other billed acts included Rhoda Royal's Liberty Horses, trapeze artists, Karise Turner and her flying ballet, Johnny Jordan, Albert Powell, and George Arely and the Bell-Jordan-Marks Troupe. Among the more well known sideshow acts was Schlitzie, "The Pinhead." 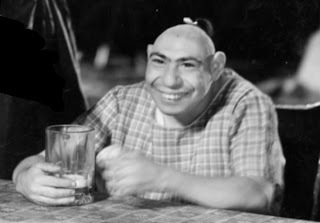 Schlitzie was born with a neurodevelopmental disorder which caused him to have an unusually small brain and a height of four feet. Schliztie Surtees starred in the 1932 cult film Freaks and was a long time circus side show freak with Barnum and Bailey. After the last performer left the ring and the workers began sweeping the pop corn and peanuts from the abandoned grandstands, several local miscreants got themselves into an affray with a circus employee. Three men got into an argument with side show workers over money. Dublin police pulled out their bud nippers and broke up the ruckus, but one of the men went back and retrieved his gun. Enlisting the aid of two conspirators, the unnamed man confronted the circus employees, cutting one of them in the throat while others fired their guns, none of which struck their targets. The three young men were arrested, but when circus employees failed to show for a 9:00 a.m. court appearance, the charges were dropped. Within four years, Tom Mix's iconic career would come to a tragic end. After visiting with the Pima County, Arizona sheriff, Nix stopped in at the Oracle Junction Inn. Mix went on his way after talking by phone with his agent. Mix, reportedly driving at nearly 80 mph through the desert, swerved to avoid hitting a construction barrier which blocked a washed out gully. A large aluminum suitcase, which contained money, travelers' checks, and jewels, was catapulted forward from the rear of Mix's car and struck him in the back of his head, smashing his skull. In an instant, the man who was shot at by the bad guys and always survived was killed by his own suitcase. It wasn't exactly Barnum and Bailey and The Greatest Show on Earth. But, it was on that thrilling early autumn day when a troupe of circus performers gave us a show of a lifetime and the King of The Cowboys came to town. I have just purchased a collection of glass plate negatives, amongst which are 14 images of the Tom Mix Circus, including the original of the 4th image shown on this page. I'd love to know who took the image.